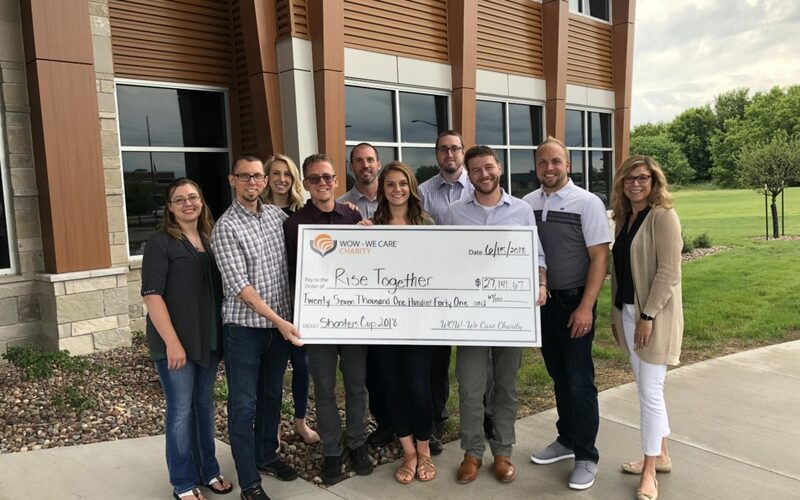 WOW – WE CARE CHARITY, Inc. hosted its Fifth Annual Shooters Cup Fundraiser on Friday, May 4, which raised nearly $30,000 for youth-focused drug and alcohol awareness group, Rise Together. The Shooters Cup is a sporting clay competition to test participants’ shotgun proficiency. It is a unique event complete with team, individual, and beginner activities. This year’s event, which was hosted at Triple J Wing and Clay in Brillion, Wis., saw a record 171 attendees. Much of the money was raised through sponsorships donated by WOW Logistics™ vendors. To help raise additional funds, WOW Logistics President and CEO, Howard Kamerer, competed against a WOW Logistics’ vendor in a shooting accuracy course using sniper rifles. Attendees of the event donated in favor of one of the competitors, and the loser had to match the donations in their favor. The WOW – WE CARE CHARITY board and members of Rise Together met on Friday, June 15 for a formal check presentation. WOW – WE CARE CHARITY has been partnered with Rise Together since 2016 and will continue their partnership for the next couple of years with the goal of helping Rise Together become self-sufficient.